January 16th - Feb 1st, 2009 are the dates to enjoy Jasper in January 2009. Come and enjoy the fun that Jasper in January 2009 will bring. 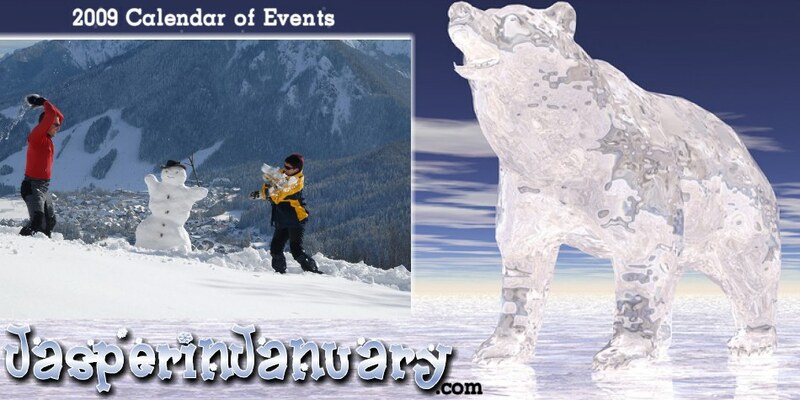 You are sure to find something fun and exciting to do in Jasper during Januaries' winter wonderland celebration! Jasper in January 2009 also offers many discount room deals, reduced lift ticket prices, and local retail specials. Join us in Jasper National Park to experience what real winter fun is all about! 2009 dates are January 17th - Feb 1st. *Please re-write this Jasper email address when sending. Events and Festivals at Jasper in January - 2009. Jasper Booster Scavenger Hunt more..